Please note that all features above are available in the Multi-Range Tritium Monitor. Items marked (*) are not available in the Single-Range version. 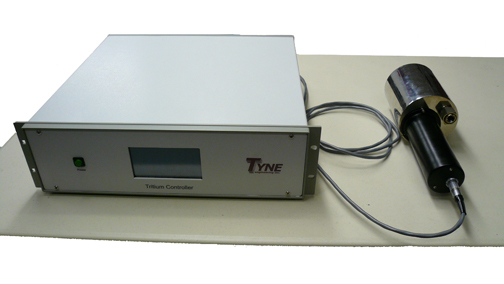 Tyne Engineering is the only company that has specifically designed a tritium detector to be placed inside of a process loop rather then adapt a room air monitor for the task. This gives the customer a great advantage because the tritium detector is now a proper in-line measurement device that has a small footprint, is 1x10-9 Helium Leak tight, is a pressure vessel to 150 psig, and operates above 100°C. The tritium detector can be either a 1000cc or 10cc in-line ionization chamber. The 1000cc detector gives the maximum sensitivity and the 10cc detector gives the maximum detection limit. The signal from the detector can be connected to the low cost, Single Range Tritium Signal Processor, or to the touch screen, auto zeroing, multi-ranged Tritium Monitor. Use the above chart to select the system that best fits your needs. The Multi Range Tritium Monitor is used to measure, alarm and control the amount of tritium directly in line of a process loop in real time. The unique small footprint detector head has the ability to handle up to 150 psig, is leak tight and can operate at elevated temperatures. The touch panel controller which can be remotely installed up to 100m away handles all multi ranging, alarming with relay output, auto-zeroing and gamma compensation functions.